The Ekambranatha temple in Kanchipuram is dedicated to Lord Shiva. 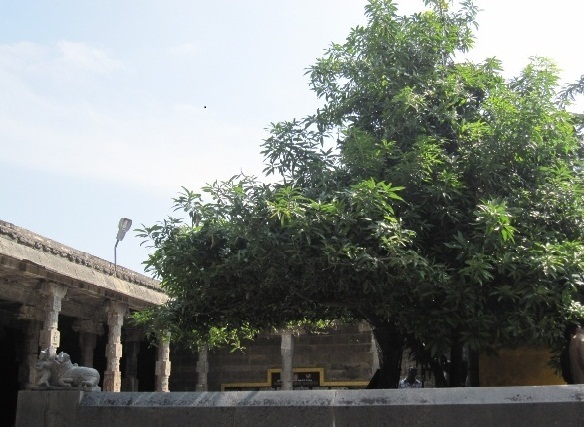 It is believed that Goddess Kamakshi performed penance to the Lord here under a Mango tree. One can see the Mango tree till date inside the temple complex. The age of the tree is estimated to be more than 3000 years old. Another amazing feature of this tree is that it bears fruits of four different tastes each season. Right under the tree, there is a shrine of Lord Ekambranatha and Kamakshi. HELLO i loved your blog. thanks for sharing your work. im from coimbatore and im starting my garden now. Waoooo.....amazing...it's incredible tree.i love your blog. That is where I grew up. The photograph brought nostalgic memories. Thanks. Fantastic post in the blog...3000 year old mango-tree is awesome...We have Mango gardens in Sangrampur and I can vouch that Mango trees and gardens are awesome sights indeed.